One more accused allegedly involved in the recent brutal attack on social activist Agnes Kharshiing and her aide, Amita Sangma in East Jaiñtia Hills district was arrested. According to police, the accused identified as Hamlen Rymbai (39) of Wapungskur village has been arrested and he was remanded to police custody for three days. Agnes and Amita received severe head injuries after they were attacked by a group of between 30 and 40 people suspected to be mining mafias at Tuber Sohshrieh village on November 8 when they were returning from Lad Rymbai after lodging a complaint against illegal mining and transportation of coal. Two accused identified as Elphon Dkhar (22) and Meklison Siangshai (26) were also arrested by police one week ago. The attempt to kill Agnes and Amita was the second attack on social activist with the first incident was the murder of RTI activist and former President of Jaiñtia Youth Federation, Poipynhun Majaw on March 19 this year. Police are yet to solve the case in connection with the murder of Majaw. Meghalaya Governor Tathagata Roy on Saturday visited social activist, Agnes Kharshiing and her associate, Amita Sangma in NEIGRIHMS who were brutally attacked by coal mafias in East Jaiñtia Hills district on November 8. The Meghalaya Governor and the first lady of the state, Anuradha Roy, reached the intensive critical care unit of NEIGRIHMS at around 10 am and met Agnes and Amita in the hospital. The first lady shed tears when she saw Agnes and Amita in the hospital beds. 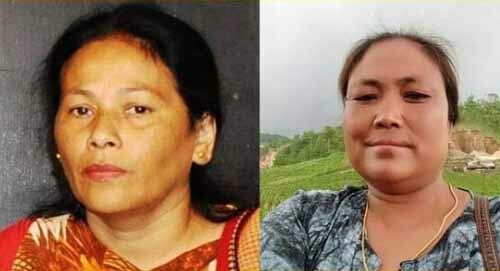 Amita Sangma also cried before the Governor and narrated to him about the brutal attack.